When it comes to kitchen remodeling, it’s hard to trust just anyone. Your kitchen is the life of your home, and no room in your house requires more attention to detail than the place where you gather with loved ones, enjoy refreshments, and prepare family meals. When seeking out the perfect kitchen remodeling contractor, trust the professionals at Reborn Remodeling Solutions to transform your kitchen into your own personal culinary oasis. We have been a family-owned and -operated business since day one back in 1983, and we have expertly remodeled thousands upon thousands of kitchens along the way with stunning results. When you choose Reborn Remodeling Solutions for your kitchen remodeling project, we will work with you each step of the way. From visiting your home to take precise measurements to updating you on specifics, we will be beside you from beginning to end. We are committed to customer satisfaction, and we make it our mission to turn your kitchen into the one you’ve always wanted. We even have financing available to help turn your dreams of a new kitchen into a reality. If you would like to find out more about kitchen remodeling from Reborn Remodeling Solutions, please contact us by e-mail, stop by our 40,000-square-foot showroom and manufacturing facility in Anaheim, or give us a call at 1-877-371-4943. 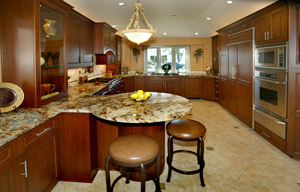 We would be glad to give a tour to residents of Mission Viejo, Yorba Linda, Placentia, Orange County, Santa Ana, Fountain Valley, Brea, Laguna Niguel, Huntington Beach, and other surrounding communities and show you firsthand how Reborn Remodeling Solutions can transform your southern California kitchen. "Our Experience with Reborn Cabinets was Great."